When receipts are emailed, they are not sent from your iPad device, but rather from the 3dcart store. This way, the receipt is shown as coming from your already configured online store presence instead of your personal email address "sent from your iPad." 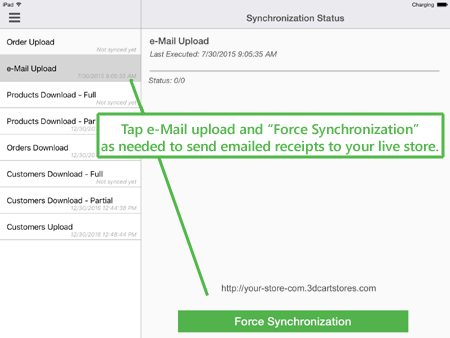 As with the other synchronization options, email queues are sent to the store on a regular basis. However you also have the ability to force the synchronization as needed. Once there, tap on the "e-Mail Upload" option. On this page, you'll be able to review the last time receipt emails were synchronized to the store. Additionally, you'll see a button at the bottom of the screen labeled "Force Synchronization." Tapping on this button will send the POS App's accumulated email queue up to the store for delivery.